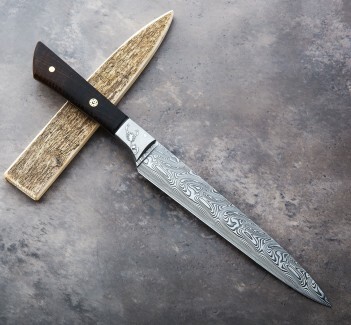 Hand forged at his shop in Ireland, Jelle Hazenberg normalizes the White No.2 and 22-layer damascus clad blade three times and quenches in water to provide a hardness of 63-64 HRC and a high-performance cutting edge to reap the best that this folded steel which he sources for his beautifully designed and superbly executed chef knives has to offer. 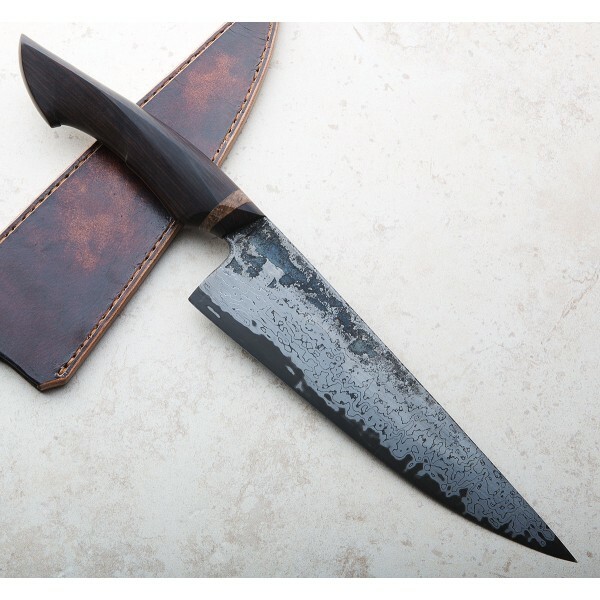 At 193mm / 7.6" this is a larger blade from Jelle, tapering to an extremely thin and handily aggressive tip at a fast and light total weight of just 5.8oz / 164g, and dressed in a gorgeous blackwood & beech wood handle. A handmade leather sheath is included. 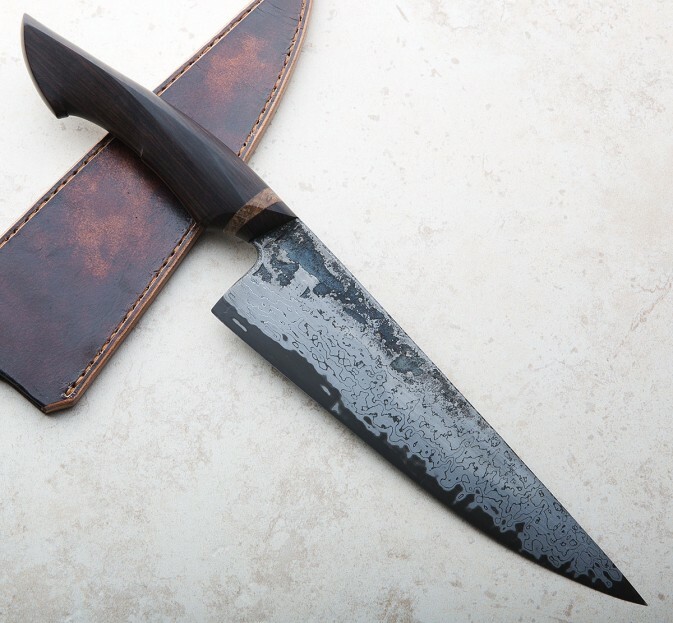 Jelle Hazenberg hand forges uniquely designed, purpose-driven kitchen cutlery at his small shop in Ireland. Previously working in commercial kitchens processing vegetables in bulk, his geometry and designs are driven by his own needs at the cutting board. His unique and always recognizable look represents a combination of form and function that we love, a result of his creative vision and his hours spent using the tools he now creates. Blade length: 193mm / 7.6. Overall length: 335mm / 13.2". Blade width at heel: 3.8mm. Blade width one inch from tip: 0.9mm. Blade height at heel: 50mm. Weight: 5.8oz / 164g. 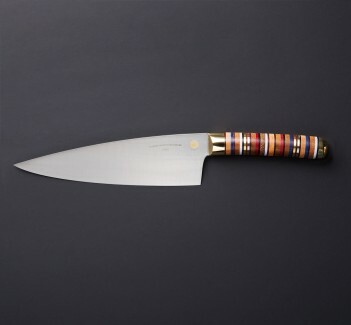 Blade: San mai with White no.2 core and 22-layer Sumingashi cladding. 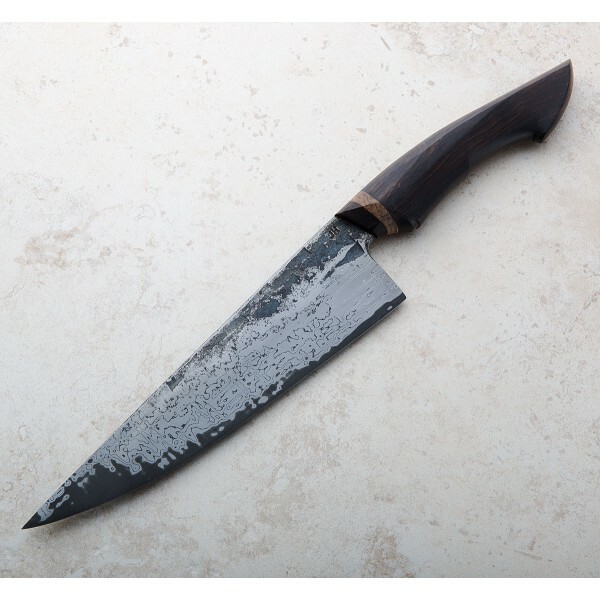 Handle: Stabilized Curly Australian Blackwood with Poplar Burl bolster. Leather saya.